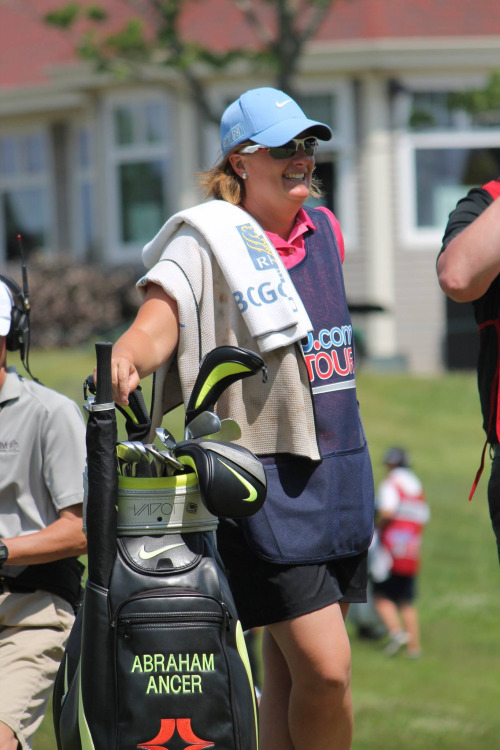 The week I spent as a Caddie during the Nova Scotia Open is one of most amazing weeks of my career and personal life – A week I will never forget! Any chance I can get to be inside the ropes of a professional golf event I want to be there. 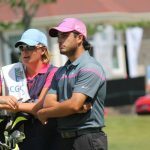 I first met Abraham Ancer at last year’s Tournament and was on the bag for him on Friday. He didn’t make the cut, but he did make a charge on the back 9. I saw that he was 39th on the money list this year. So I sent him a quick note on twitter congratulating him on his impressive play and asked if he was coming to Halifax again. He responded by asking me to be his caddie. 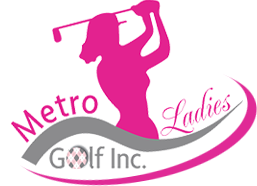 The 2015 Nova Scotia Open was the second time The Web.Com Tour event was held at New Ashburn Golf Club in Windsor Junction. 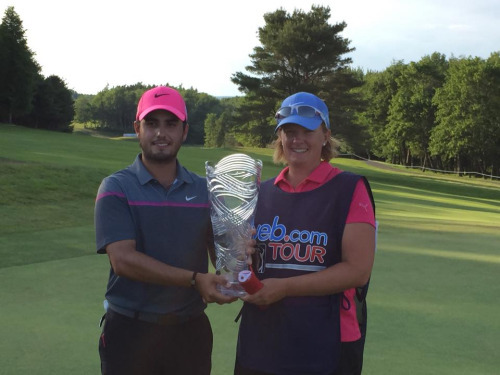 Abraham Ancer, 24 of Mexico put together 4 solid rounds of golf to capture the Championship. He did so in dramatic fashion with a nearly impossible putt on 18 to force a two-way play off. He came into the week with solid ball striking and he knew if his putter got hot he could finally win. That is exactly what happened. I helped read the greens and determine the speed so he could just execute the putt. For him, being committed to his putting stroke was all he needed to win. I spent 14 years working at Ashburn Golf Club, 12 years as a golf professional. I was confident I had the knowledge to help him win. Abraham put his trust in me and we made a great team. It was great to win in front of so many friends who you could feel were hoping for you on 18. It was a surreal experience. On Saturday, moving day Ancer fired a red hot -7 to land in the final group on Sunday. Something we can only dream about. Saturday’s round was a lot of fun. We decided all week we wanted to have a good time out there. Our playing partner and his caddie enjoyed the day as well. We laughed a lot, told stories and cheered each other on. Make no mistake, Abraham is a serious player with serious talent. When it was time to execute he did just that. He has every shot in the bag and hits the ball out of sight. Fast forward to Sunday afternoon – It dawned on me that morning that we would be on centre stage. 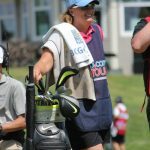 I was interviewed by Kay Cockerill, LPGA star and Golf Channel announcer on the driving range. During our round things began to unfold like a scene of a movie. #18 played like a monster from the tips. A par might get him in a playoff but his playing partner hit a terrific drive and left his second shot below the hole. That day, a birdie from where he was laying above the hole, side hill, 35 feet never felt impossible. I saw the line right away and confirmed the last two feet would break hard. He put it dead centre! I have spoken to many people after that day who told me how impossible that putt was. I know if you tried that putt 100 times you may never sink it. It seemed the golfing gods were with us on that green. Abraham didn’t just win the tournament, he birdied the toughest hole twice that day to win! Impressive skills – Abraham is a tough competitor who knows what it takes to compete. He has every shot in the bag. Being self-taught he has a natural swing that can produce any type of shot shape he needs. 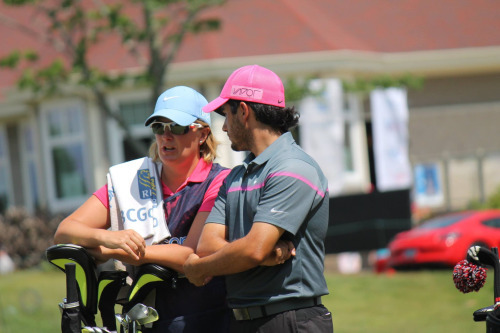 Course knowledge – Being around the course for many years I think I have been on every blade of grass out there. I know the greens, the slope, but also how a ball will react when it is hit into it. 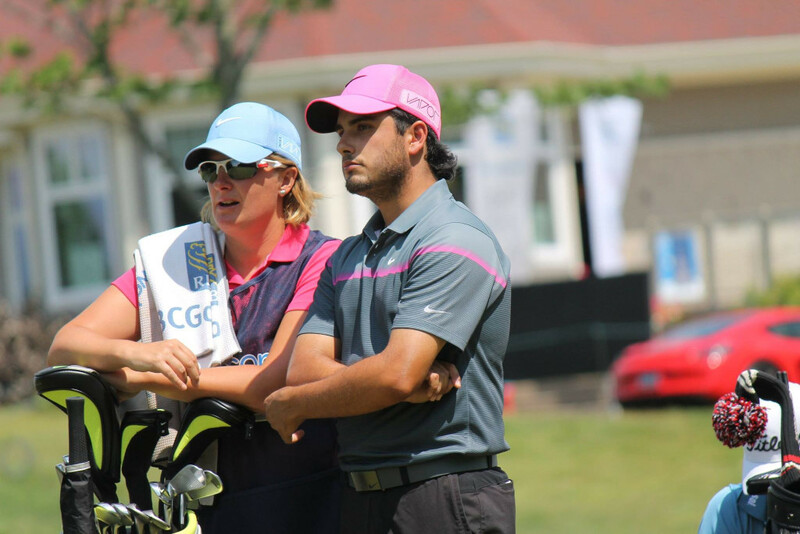 Good luck – The result of hard work and preparation- And a lucky loonie for a ball marker. Mental Toughness – We only talked positive all week. Tried not to get discouraged and always saw the opportunity. He is a calm guy who drew from his many tournament experiences to make what seemed impossible happen. Trust – Abraham trusted my ability to read the greens and he trusted himself to execute. He was confident in his ability. Fun– Above all we had fun. At 24, Abraham knows what he wants to do for the rest of his life and know what it takes. He never lost sight of the fun you need to have out there. Enjoy the moment, enjoy the shot and enjoy each other. He has a deep devotion to his family and we shared stories and laughs on the fairways. With this win Abraham has secured a spot on the PGA Tour for the 2016 season! I wish him every success and know his calm demeanour, sense of humour and mad skills will make him a star. I am proud to have shared in this experience.